This is becoming a definite pattern for the New Year 2010, getting totally saturated in science that is. Today, I had an excellent Caltech lecture to attend. I took in an Astronomy Colloquia entitled “Massive Star Formation through the Universe” presented by Jonathan Tan of the University of Florida, Gainesville. Dr. Tan is one of those model researchers whose eloquent speaking style (coupled with an engaging British accent) is only surpassed by his quite evident brilliance in the field. This is a fascinating area for me because of my new interest in Galactic Center research. Tan led the capacity audience in the new Cahill center auditorium through a discussion of several open questions in our understanding of massive star and star cluster formation. He described the current view of how the first generations of Population III stars were born (stars in the range of 140-200 solar masses). These stars, some believe, are the progenitors of supermassive black holes (in excess of 1 million solar masses). Much of the work being done to understand massive star formation is through numerical simulations. One problem with this approach is that the calculations are so complex that modeling 1 year of a star’s formation takes 1 year of computer time! Tan quipped that it would take a grad student with significant longevity to model the desired goal of 100,000 years! 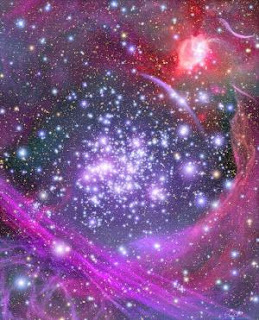 One particularly interesting massive star cluster is the Arches cluster (see inset artist’s rendering) lurking in the heart of the Milky Way. Arches is a 2.5 million year old luminous cluster of about 2,000 stars that is not visible in optical wavelengths. It is the densest known gathering of young stars in our galaxy. Infrared observations by Hubble and ground-based telescopes allow astronomers to peer into the depths of the cluster. At the end of the lecture I got a chance to chat with Jessica Lu, Caltech postdoc originally from UCLA who is a member of the UCLA Galactic Center Group. I met Jessica last September when I attended a Keck II remote observing session at UCLA. She is interested in massive star formation because of the cluster of young massive stars found at the center of the Milky Way. Daniel, I'm glad you are back posting again, I enjoy all your science reports. Plz keep them coming..